If Moo Shu Pork is your go-to on the take-out menu, why not try making it at home instead? This easy-to-follow recipe makes the result virtually foolproof. Cut chops into thin strips. Mix barbecue sauce and 1 Tbsp. ginger until blended. Heat dressing in large skillet on medium-high heat. Add meat, in batches; cook and stir 2 min. or until no longer pink. Remove from skillet; cover to keep warm. Add onions to skillet; cook and stir 3 min. Stir in cabbage, mushrooms, bean sprouts, peppers and remaining ginger; cook 5 min., stirring frequently. Return meat to skillet; cook and stir 3 min. or until done. Remove from heat. Stir in 1/4 cup barbecue sauce mixture and nuts. Spread remaining barbecue sauce mixture onto tortillas. Top with meat mixture; roll up. Heat oven to 325ºF. 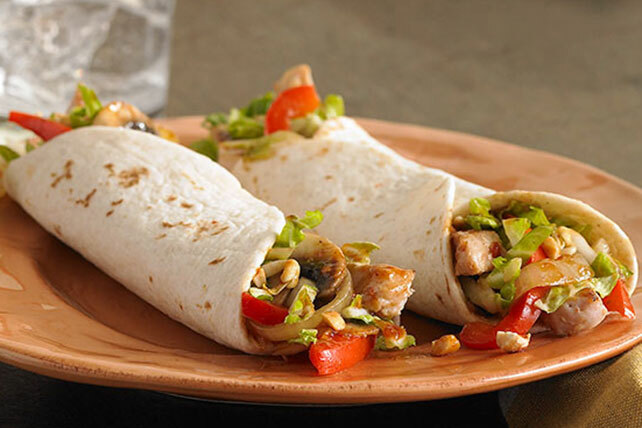 Wrap tortillas in foil. Bake 8 to 10 min. or just until warmed. Substitute crêpes for the tortillas.